Who else knows that I'm a furry fractal? I'm getting hugely excited about the new site and logo that Lucy Pepper is making for me. It's going to bring all the different parts of me together in Joomla (a CMS that comes as an easy install with DreamHost). I first met Lucy when she was Vitriolica on Unkempt women and I was in Em Duas Línguas. We met through our blogs and discovered we lived down the road from each other did some blog chick bonding at my house in Setúbal. The process of getting to my logo design could only have been done with someone who knows me - how lucky am I to have such talented friends? The end of January and it should all be ready. Got to get my skates on. Still on the trail of making sure I don't pay taxes I don't have to I opened a Skype business account, which means that I don't have to pay VAT on the SkypeOut calls I make. You register for the business account (for which, btw, you can have several users) and enter your VAT number. 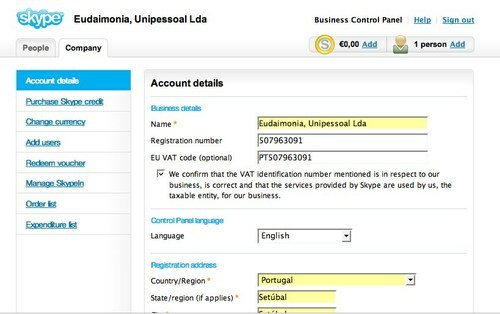 The first time I did it I was told that my number wasn't a valid Skype number, but learned from a friend that a European VAT number is your regular VAT number (NIF in Portugal) with your country code in front of it. And thanks, Rory, who lives in France has a business in UK and the Czech Republic that he runs from a Mac and who I bug for tips! Yesterday I was invited to go into business with a dynamic, entrepreneurial group of young guys in Portugal with a portfolio of companies that range from online sales to communication design and web applications. They wanted me to articulate my business model, a task I stumble over but shouldn't. Who am I? What do I offer, to whom? Who are my partners? How do I generate revenue? What is my vision? One thing the conversation did was make me realise how important my independence is. No, I don't want a salary and no I don't want a percentage arrangement. I would like to work on a project basis, with partners that I know and trust, and where the projects have boundaries, budget and outcomes. I want to be free to dance in the gaps between generating revenue, learning, writing and carrying out research. I like working from home, but I also physically need to be with other people, including bright, young people. Also, I like hands-on doing and being, but I have to have gaps for reflection and writing up - increasingly, in narrative genres. An income-generating communities of practice approach to action-research of social learning in Portuguese, international settings. I think that's what drives me, although I'm not sure how to represent it as a business model. Nor if it would attract big investors! The website for my new company - Eudaimonia - is on its way. Feedback very very welcome. Content and presentation. Complaints about style go to Euan Semple, who I have imitated and adapted! I decided not to have one site in English and the other in Portuguese, but to put everything on the same page. I should distinguish the two languages by different shades of grey, perhaps. It seemed important to put the two languages on the same page because it's aimed as much at a bi-lingual audience as it is to two different audiences: Portuguese -speaking-only and one English-speaking-only. And it just feels significant to put it on the same page. As I prepare my webpage for Eudaimonia.pt I find myself using Euan Semple's business page as a model. These are some of the things I think are really cool about his site. He inspires confidence in the way he says what he does and doesn't do, and by the style of his language. Thank you Euan. I hope you take it as a compliment and won't hate me for copying lots of your ideas.